Bolton, United Kingdom – Heating bulk solids can pose a significant challenge to process engineers. Often the material itself is a poor thermal conductor, and excessive heat may be applied which risks damaging the material. Solids handling equipment maker, Ajax Equipment, has found a solution to the problem. By applying its innovative cascade mixing technology, Ajax has developed a thermal blender capable of heating and mixing 10 tonne batches of a mineral product at temperatures up to 200°C for a leading chemicals manufacturer. For maximum heating efficiency of bulk solids, it is necessary to interchange heated particles with those not in contact with the heated surface. This both distributes the heat and provides the highest temperature difference between those particles in contact with the heated surface. 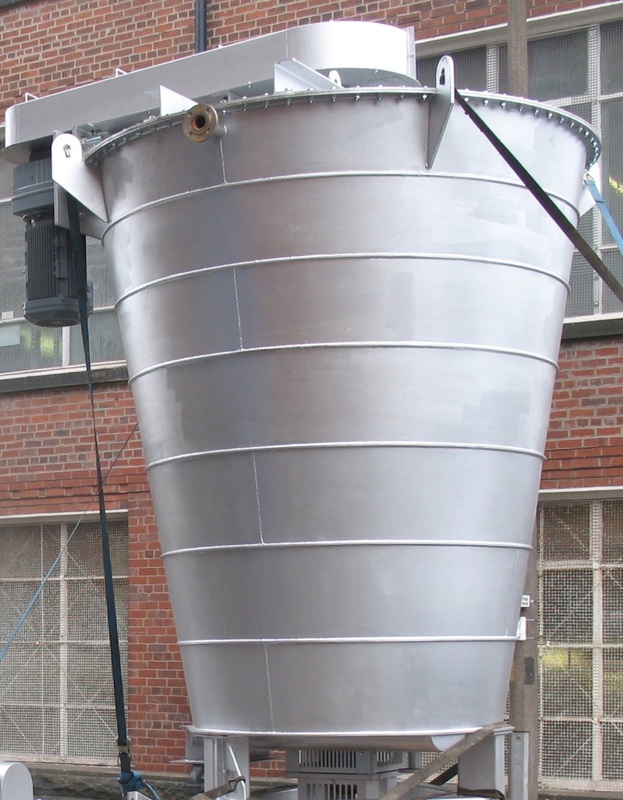 The thermal blender uses a central vertical recycling screw to elevate the powder and cascade it onto the bed contents and down the hopper section, taking advantage of a bulk solids natural tendency to mass flow. In this way, the mixing action homogenises any thermal difference between different regions of the material being handled. The recycling screw has a large entrainment diameter and inlet scoop. This reduces the headroom requirement of the hopper section to enable relatively large capacities within the squat thermal blender. Moreover, the depths of the flights along the screw shaft gradually increase in depth and pitch to entrain product in a progressive manner to avoid shear through static bed. The Ajax thermal blender supplied to heat mineral products incorporated an insulated, jacketed hopper and internal heating of the screw by hot oil, providing an efficient wiped surface heat exchanger and homogenizer that gave a compact solution to the client’s requirements. Appreciating the Oppurtunity to work With the Leading AJAX Equipment. Provide Us with the Detailed Requirement Of the Needful Systems, Machineries To be Designed manufactured . Request You to send the Needful Drawing(if Available), Parameters on the Below Noted email. Visit our Website for Our Works.